From a very early age, I can remember the first time in school that someone picked on and excluded me because I was heavier than all the other kids. It was the first time I realized I was somehow different from the other children and it hurt me a lot. This continued my whole academic career with instances that included profane name calling, public humiliation, and physical harm towards me. It is our job as early educators to start talking early about kindness and respect to the children in our care. One way I encouraged this in my preschool class was by having a time set aside for us to talk about our feelings each day. We had a group-sharing time where I would pass around our pillow/bear and the child holding it got to tell how they felt (happy, sad, mad, scared, etc.) and why they felt that way. Children weren’t required to share if they didn’t want to. I always gave them an opportunity after to pull me aside and tell me something privately if they preferred. We would talk about how to help our classmates celebrate a happy feeling, or help them feel better about a sad, mad, or scared feeling. It helped some of the children to talk about their emotions and work through feelings together, not by themselves, creating a community. Sometimes I included stories and finger-play songs to help teach. Model positive ways for young children to make friends. For example, practice pleasant ways that children can ask to join others in play and take turns in games. We can coach older children in our program to help reinforce these behaviors as well. Encourage children for appropriate behavior. Help young children understand what behaviors are friendly. Help young children learn the consequences of certain actions in terms they can understand. Encourage young children to tell an adult if they are treated in a way that makes them feel uncomfortable, upset, unhappy, or if they witness other children being harmed. Teach them that it is okay to stand up for others in need if they feel safe to do so. Set clear rules for behavior and monitor children’s interactions carefully. Step in quickly to stop aggressive behavior or redirect it before it occurs. Encourage age-appropriate empathy for aggressive behavior. Young children should be encouraged to apologize in their own way whenever they hurt a peer, even accidentally. Guiding questions from you may include “What can you do/say to help ____ feel better about what happened?” Some younger children are still learning what ‘apology’ and ‘sorry’ mean so be patient and respect their approach to it. Not all apologies and expressions of empathy are the same. With patience, understanding and a positive approach, we can help children recognize that kindness and empathy can go a long way in the world today. This entry was posted in Best Practice, Early Childhood, protecting children and tagged acts of kindness, bullying, developmentally appropriate practice, social emotional development, teaching children kindness on December 13, 2017 by Bridget Jackson. How can we encourage children to be kind? As I think about that, I can agree with it. I came in contact with children who ignored directions. Children who talked while the adult was talking. Children who watched someone drop a pencil and just walked on by without picking it up. Children who watched another child fall down without doing anything to help. In my brain I get respect and kindness intertwined. Although I think there are similarities, I also think they are different. We do kind acts with respect. How can we encourage children to be kind? As adults, there are many things we can do in our personal and professional lives. While driving we can not scream at other vehicles. While in the grocery store we can push the cart on one side of the aisle instead of taking up the whole aisle. In school we can talk to children in a kind tone of voice. We can give children acceptable choices. While walking to the school bus with the children we can assist the child who needs a shoe tied. Are these things respectful? I believe so. I believe they are kind acts done in a respectful way. We can point out the actions children are exhibiting that are kind. When we see Johnny give Elizabeth a tissue because she has a runny nose, we can say, “Johnny, I saw you gave Elizabeth a tissue. That was very kind.” When we see Sylvia walk around Monica’s block structure instead of walking through it, we can say, “Sylvia, you walked around the block area. I know Monica appreciated that!” When Bobby is struggling with his math homework and we see Elijah helping, we need to make sure we make a comment telling Elijah we noticed and how kind he was being. During our camping trip, I was challenged significantly when children did not listen to my words. I was challenged when children talked while I was talking. I was challenged when after three miles of rafting; the children were still hitting oars while paddling. There were times when I was not kind. There were times when I blurted out, “Just listen!! !” When I calmed down, I had to remind myself that I needed to be kind. I needed to model kindness to the children. That’s not always easy to remember. For me, there are times I need to talk to children and either apologize for my words or to speak to them clearly about my expectations. I think it’s important for adults to acknowledge when they are wrong. There was one incident at camp when I was rude to a girl and needed to follow up with her regarding our interaction. It was so easy to spout the rudeness she was giving me right back at her. It was a little harder to apologize to her and say I was wrong about being rude and that I needed to be kind. It was even harder to be kind when her behavior did not change. Even though that behavior did not change, I still tried hard to be kind. No one deserves to be treated unkindly. How are you showing kindness to those you interact with? 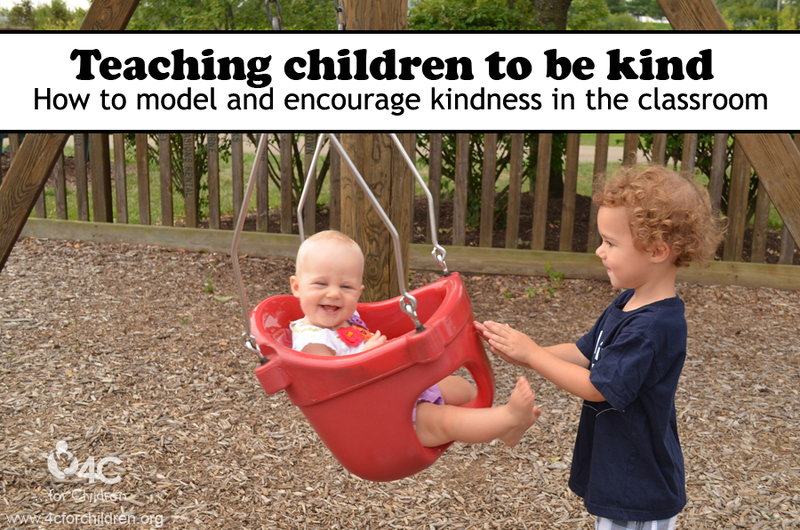 This entry was posted in Preschool, School Age and tagged kind, teaching children kindness on July 16, 2014 by Christine Fields.